May 19, 2015- Our First Day! There are many things that need to happen before we can start digging. Background research needs to be conducted, proposals written, permits granted, and funding secured months before the project begins. Once the project starts, we need to lay in a site grid, which will help us know where artifacts are located. That locational data is just as important as the artifacts themselves because they help us understand context. A 2009 penny found on the surface may have fallen out of someone’s pocket, but a 2009 penny located beneath artifacts from the 1800s tells us that area has been disturbed. Here are some images of what we’ve been doing today. 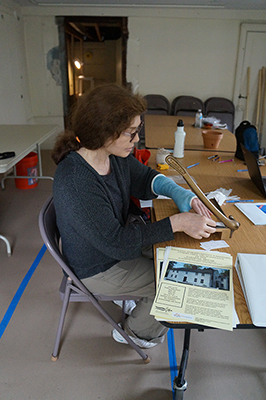 Mary is cutting tags that will be kept with the artifacts. Each tag tells us where the artifact came from, how deep it was located, and identifies the artifact. Jill and Elena are mapping in the site so that we have a record of what it looked like and what was located on the surface before we start excavating. 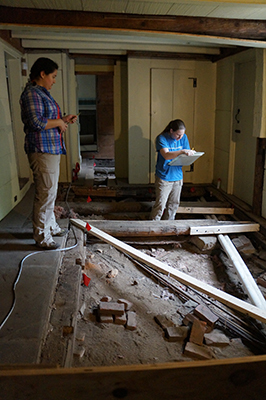 ← Follow along with our excavation!